Solero office furniture is funky and fun, adding a contemporary vibe to any office space. 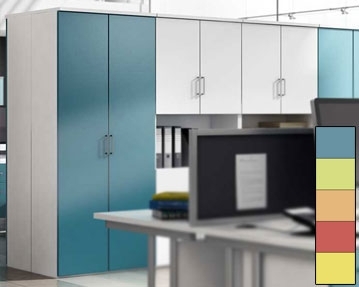 Choose from blue, green, orange, red or yellow matt finish fronts to add an accent of colour to pedestals or storage cupboards. Solero office desks and accessories are made from melamine, which is durable and easy to maintain. The contemporary lines of the square metal handles on our Solero desk pedestal units add a stylish edge to this collection. These storage solutions are all hardwearing and feature a drawer for filing documents and a smaller stationery drawer. Our pedestals are lockable too for added security. 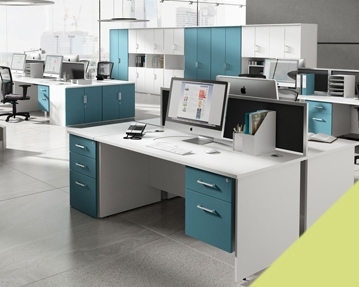 Not only are Solero office desks available in cool colours, but they come in a range of configurations, including corner desks and ergonomic desks, in addition to the traditional rectangular desk. Our Solero office desks have been fitted with adjustable cantilever leg frames to provide maximum comfort. What’s more, all our Solero office furniture - including our desks, pedestals, cupboards and filing cabinets - comes with a 10 year warranty. If you think that the Solero collection might be the right one to bring a touch of colour, comfort and personality to your office space, simply place your order today or contact us to find out more.